This is a simple, intuitive method of training robots. The hardware and software algorithms inside the robot can be quite simple, but still allow for a wide variety of behaviors: a superset of the behaviors exhibited by Braitenberg vehicles or BEAM robots equipped with up to three sensors (front and rear bump, and light). 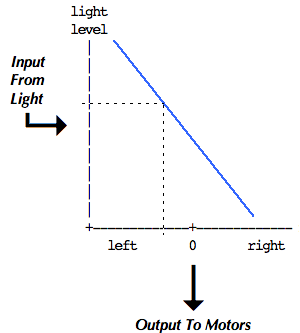 In this simplified overview, a robot is "taught" to choose motion to the left or right depending on the level of illumination. the second method (in which the owner gently guides the dog through the desired motions) is what I call Show-Me training. Suppose you have a robot that has two motors (A and B) connected to left and right wheels, and a third wheel (for balance) that just pivots and rolls like a caster. It also has one touch sensor, placed behind a bumper on the front of the robot. It also has a button called "TEACH" and another called "GO". In this first example I had two motors going in opposite directions. Perhaps the robot is built that way  the motors are on opposite sides of the chassis, one with its output shaft pointing right and the other pointing left, thus if they both rotate clockwise the chassis would turn in little circles. But suppose the builder rebuilt the robot so that the motors point the same way, adding gears to make it so that you have to run both motors clockwise to get forward movement. Now the robot needs to be reprogrammed to get the same behavior. The user would simply repeat the Show-Me training and the robot would learn that it should turn one of the motors the other way. The robot doesn't even need to know what has been changed  as far as it knows, maybe it's being trained to turn in circles. If the software wanted to be fancy it could even measure the speeds and delay timings. I have implied part of this in the above example, in the pseudocode line that says "wait 1.5 seconds". A much richer set of behaviors would result if the firmware noted the motor speed, and kept track of how much variation in speed takes place. Statistics such as mean speed, standard deviation, frequency of changes, rate of acceleration, etc. could all be gathered and used as parameters in a pseudo-random motion generation function used during GO mode (behavior playback). 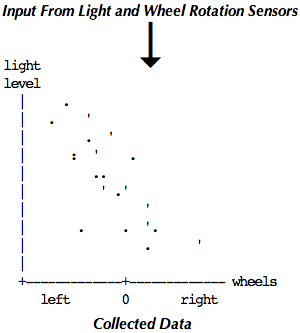 The points are widely scattered, but there is a correlation that can be roughly described by saying that the motor goes faster at lower light levels. This data can be analyzed by the firmware using standard two-variable linear regression, and the resulting slope, intercept, and correlation coefficients used to generate behavior during GO (behavior playback) mode. 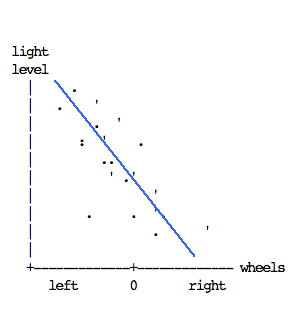 In fact, the same concept can be generalized to a multivariable linear correlation technique that correlates all of the inputs with all of the outputs. "Inputs" and "outputs" can be actual raw input levels and motor speeds, or derived parameters such as mean, standard deviation, frequency, rate of change, etc. The correlation would be stored as a matrix that maps a vector of input values onto a vector of output values. Such a multivariable linear correlation system would include all of the behaviors possible in the simpler training systems described above. That is the algorithm implemented in the "RILYBOT 4" that I showed at Mindfest 1999. This is about as intuitive as robot programming can get. All the user has to do is push the robot around and make it react to inputs in the desired way. Telling it what sensor readings to react to happens automatically as a part of the training. Reprogramming to get a different behavior takes all of 5 to 10 seconds.